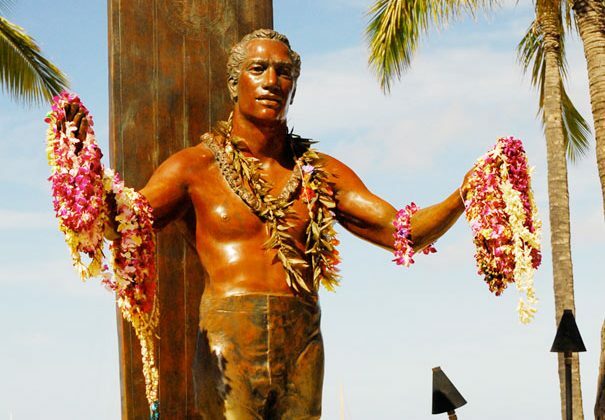 There are few things that say Hawaii like a walk in Waikiki to pay homage to the statue of the surfing legend of Oahu, Duke Kahanamoku. 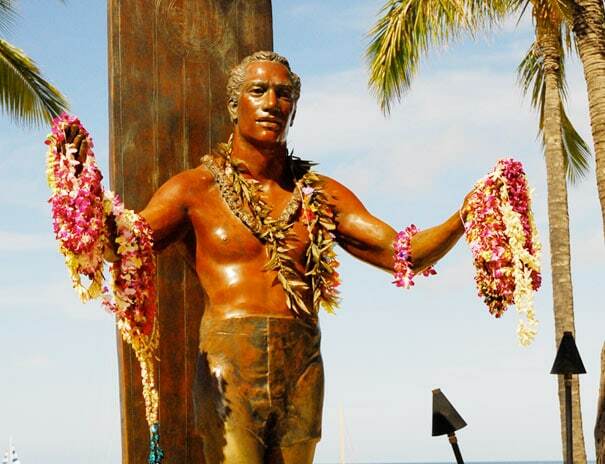 His statue is located on Waikiki Beach on Kalakaua Avenue where many honor him by placing leis on his statue. To many he’s the most famous name in surfing — an Olympic champion, a Hollywood actor and Hawaiian folk hero. Duke was an inspiring celebrity figure who hung out with the great actors and athletes of his time. This is pretty cool stuff when you realize how much Duke and Hawaii influenced surfers and athletes across the United States and all over the world. He was born in Waikiki and was a full-blooded Hawaiian, representing the Hawaiian culture to millions of people. He won three gold, two silver, and one bronze medal in four Olympics between 1912 and 1922. 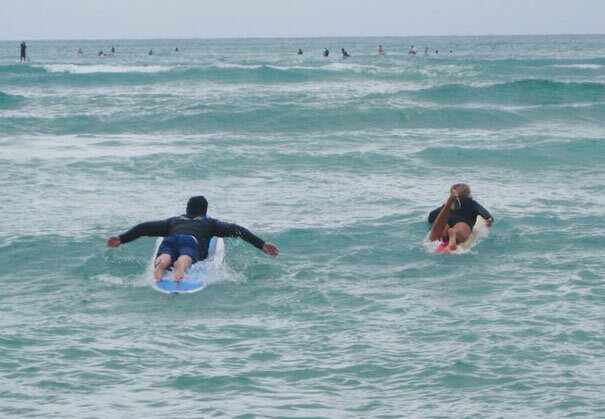 My day paying tribute to Duke started with a surf lesson with Waikiki Beach Services. Located in front of the Royal Hawaiian hotel, I was warmly greeted by some locals who were just lying on the beach living the dream, just staring out at the waves on a Tuesday morning. I saw a girl walk up with a 12 foot board in a wet shirt and said, “you here for the lesson”? I said yes soon I was geared up in my own surfing wetshirt and board. This was a great little chance to get one on one style lesson in a small group. The small group quickly grew from just me, to myself and six teens from Korea. These kids where really confused about what they where about to embark upon, almost in a disrespectful way. 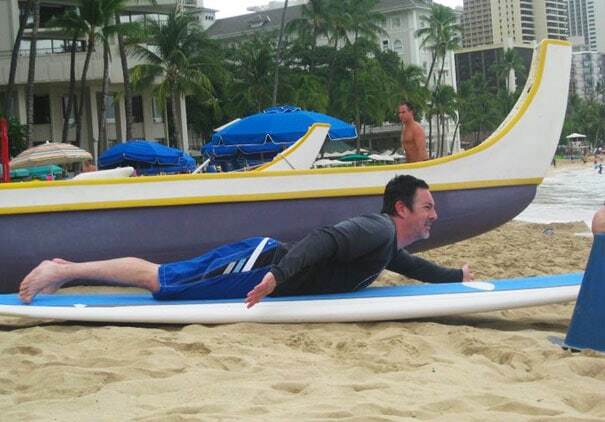 The crew at the surf school did not flinch and proceeded to try to show us how to surf. 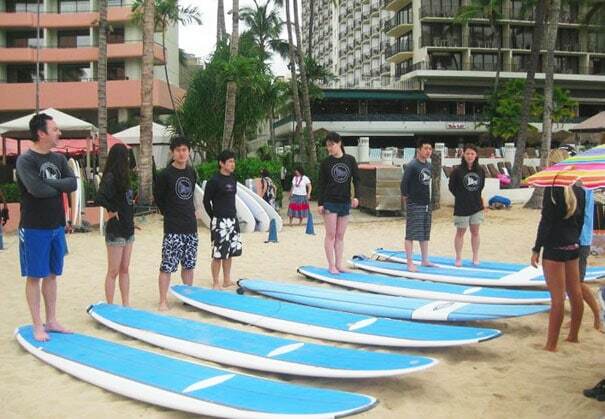 We all got a 20 minute warm up and safety rules lesson, then out in the water to start surfing. The teacher Juliet was super helpful and somehow managed all six of us in the water catching waves. The way she and her two coworkers handled the lesson was with concern for safety and good practice. It was a great first lesson. I caught 12 or 13 waves and even began to really get the hang of it. They had another guy out in the water who took pictures of all of us and gave us all a copy of a cd at the end of the lesson. It was a very cool and low pressure experience. I worked up a huge appetite after the morning surf lesson and had to try the most popular fast food joint on the island so I made my way a few miles to the Rainbow Drive In. 50 years and still going, Rainbow Drive-In has served some of the cheapest and best plate lunches in Hawaii. It’s popular with the locals and has built an almost cult following over the years. Some of the surfer specialties include BBQ + Ahi Katsu + Boneless Chicken w/tartar sauce and Portuguese Sausage or Spam or Ham + 2 Eggs. Awesome, and meals include the standard and large helpings of 2 scoops rice + 1 scoop macaroni salad or slaw. That was well worth the stop and I highly recommend it. Close to the beach and the right price. The Ifuku family (the founders of Rainbow Drive-In) started a charity that is nice to know about which was established in 2000 by Seiju and Ayako Ifuku, that awards annual grants to Hawaii-based non-profit organizations and schools. 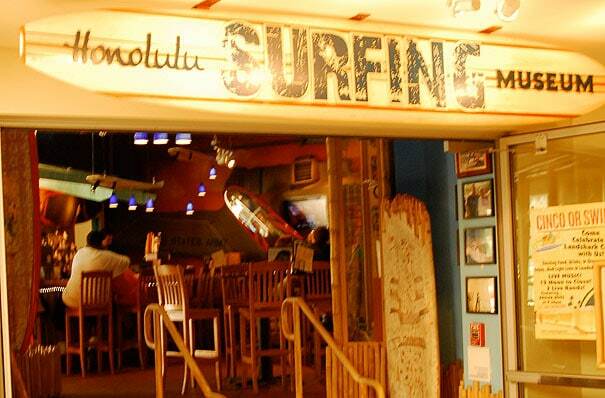 Next, I headed back into town to continue my Oahu surfing pilgrimage with a stop at the Honolulu Surfing Museum located in the Holiday Inn Waikiki Beachcomber Resort, it’s a hidden surprise. This little gem of history was the work of Santa Barbara, California surfer and antique collector James O’Mahoney. This surf buff grew up riding the waves in Santa Barbara and Long Beach, California. Apparently, O’Mahoney collected antiques from around the world, and gathered an amazing collection of surfboards and memorabilia from the most formative days in the history of surfing. It’s a great display of California and Hawaiian and surfing culture. The story of the Museum’s creation goes like this, one day while on a surfing trip up the California coast, Jimmy Buffett stopped into O’Mahoney’s museum in Long Beach and was amazed at the scope of the collection. 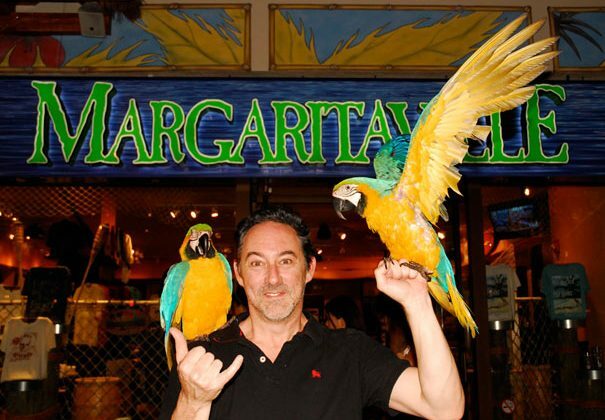 Jimmy was in the early stages of planning for the opening of ‘Jimmy Buffett’s at the Beachcomber’ restaurant and bar in downtown Waikiki. Jimmy could see the range of items and the value from early Tom Blake surfboards, to some of the first ukuleles ever made. That is just the beginning. There are very unique exhibits and artifacts that represent a mixed perspective and offer a glimpse of the impact surfing and Hawaiian culture and how the rest of the world has embraced it. If you want to see some cool stuff like the old ring worn by Captain James Cook during his exploration of Hawaii and even wooden storage lockers once carried aboard the ship. The museum also holds one of two Rell Sunn Hawaiian print dresses known to exist. Lots of iconic paintings and surf movie posters too – including original lithographs for the film “Endless Summer” and a Grateful Dead poster by late, artist Rick Griffin. So much to see for free. Oh and don’t forget the original surfboard featured in Coppola’s epic “Apocalypse Now”, and the only surfboard ever authorized by Marvel Comics and Stan Lee as the one, true space-aged ride of the “Silver Surfer”. Sit in the life sized Huey helicopter or have your picture taken atop Norrin Radd’s lightspeed starsurfer. It’s a good 1 to 2 hour trip through some interesting and one of a kind items, great for kids and adults. I wanted to see some more surfing history and a bit of Hollywood, Hawaii style. Perfect time to hit a happy hour at Dukes. What a great thing to look forward to after a few hours of relaxing on the beach. It’s busy, loud and lively. And while it’s $5.75 for a Hawaiian-brewed Kona beer is certainly not excessive. Duke’s has no specific Happy Hour, but they have live music every day from 4-6pm . So I had to make my own. The walls were filled with many photos of Hollywood celebrities, Duke, and great memorable moments of the Hawaiian legend. 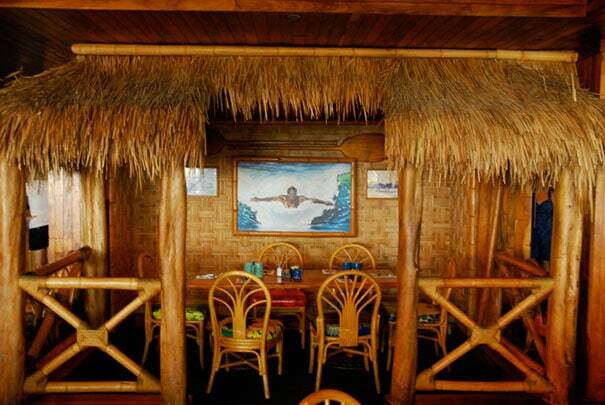 Throughout the restaurant there was a diverse and extensive array of interesting paintings and photography. All surfing related and capturing a proud moment in time. Holiday inn Beachcomber is my place to rest this great evening and I was glad it was conveniently located near all the great fun I had today. This place has historic value and was nice and clean. It had the Surf museum right off the lobby which made it easy to plan that and is located a few blocks from the sand. This hotel is located right on Kalakaua Avenue, the heart of shopping in Waikiki. Close to the beach, food and walking attractions and it was also close to the best shopping and guided tours you can get in Waikiki. This is a wonderful post and so nicelywritten. Very helpful.